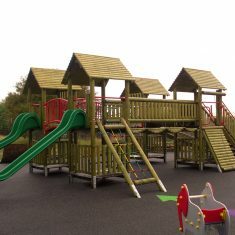 The range of Caledonia Play activity towers are constructed in 2 standard sizes. 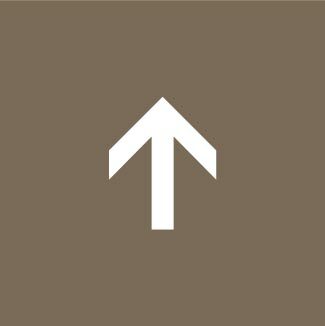 The Junior Tower Range units are 0.9 x 0.9m square with a platform height of 1.2m and the Standard Tower Range units are 1.2 x 1.2m square with a platform height of 1.5m. 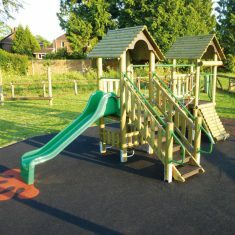 Our activity tower ranges are designed to be modal allowing the towers to be configured in any design layout with a mix of access points and interconnecting bridges. 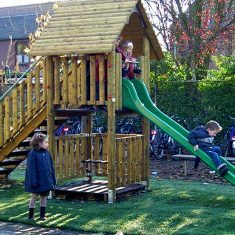 This allows the tower combinations to be designed specifically for schools and nurseries to suit the outdoor provision available and users’ needs incorporating the required activity elements and connecting bridges. Units with more towers can be supplied if required – just ask! 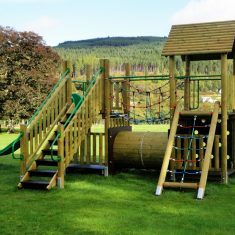 All the towers are constructed with materials that are durable and robust ensuring that they need minimal future maintenance, while still retaining the natural beauty of the timber and integrating well into rural settings. Paintwork is green as standard. The timbers are ¼ sawn machine rounded poles with a sanded finish and pressure treated. All timber legs are fitted with hot dipped galvanised metal extension legs to prevent ground moisture affecting the timbers. All fixing bolts are stainless steel, limiting any rust and corrosion. All metalwork is galvanised prior to applying electro powder-coated paint as a finish. 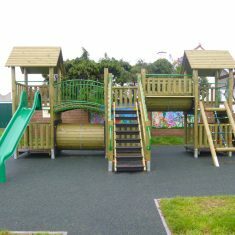 As standard the towers are fitted with a moulded fibre glass slide. A stainless steel slide can be supplied on request. 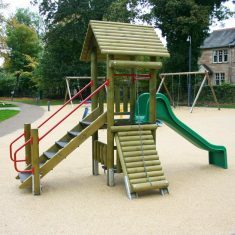 Why not add fun and educational Playground Markings when the safety surfacing is installed? Contact our sales team on sales@caledoniaplay.com for more information or call the office on 01577 840570 to speak to one of our advisors.